In the spirit of Rosh Hashanah, we hope you and your family will begin the year 5772 with a mitzvah that is meaningful to you and critical to nearly 500 frail, homebound elderly and others in need. Help deliver traditional kosher food baskets to the most vulnerable among us – and share the flavor of the holiday. Thursday, July 28 6-8 p.m. JCS Aventura Office, 18999 Biscayne Blvd. 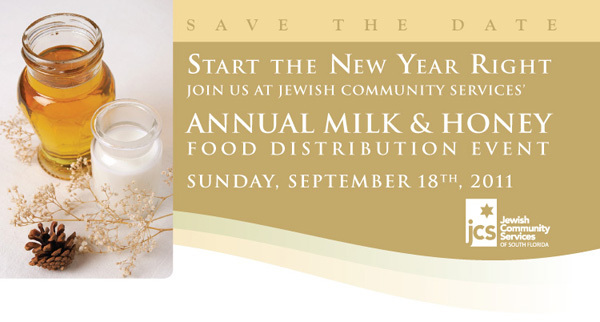 Be part of this mitzvah! Kindly contact JCS Volunteer Coordinator Barbara Davis at 786.866.2206or bdavis@jcsfl.org to schedule an appointment. This background check will enable you to volunteer for any JCS activity for five years. The cost of the screening is $52. So that all funds raised through the Milk & Honey campaign can be used to serve our clients, we ask that you absorb this expense and apologize for any inconvenience. P.S. If you were previously screened by JCS, thank you. Please contact Barbara to confirm your participation.